Incidence: 170 – 180 IMSCTs arise in North America each year. This lesion represents roughly 4% of tumors that arise in the CNS of children (3). 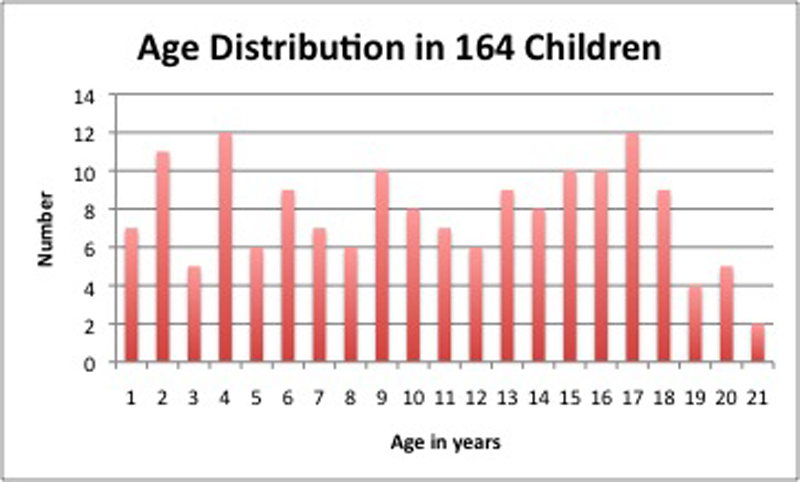 Even distribution: There is a relatively even distribution of IMSCTs across the ages of childhood and adolescence (10). Even distribution: In the series of Constantini and colleagues, 58% were male and 42% were female (10). No predilection apparent: Data are not available to determine whether there is a geographic predilection for IMSCTs. In the United States there does not seem to be one. Risk factors: No particular risk factors with regard to environmental or infectious pathogens have been described. NF1: A spinal cord tumor in a child with NF1 is likely an astrocytoma. NF2: Children with NF2 have an increased incidence of spinal cord ependymomas in particular but astrocytomas and gangliogliomas are also seen. Hemangioblastomas: The stromal cells lying between the vascular channels of these tumors consistently have lost heterozygosity of the VHL gene and thus it is felt that these cells are implicated in the pathogenesis of the disease (38).